One of early cinema’s founding myths is the tale of moviegoers recoiling in surprise and even running from the theater when presented with the Lumiere Brothers’ footage of a locomotive heading straight towards them out from the screen. While the truth of this account may forever be up for debate, there is a timeless element to it, which is the fundamental truth of photography (and film’s) ability to shock us into questioning the limitations of the visual world, our perception of it, our relationship with it. Light & Matter: The Photographic Object, at the Michener Art Museum, does just this: jolts viewers into examining visual and perceptual givens and space, asking them, ultimately, to reconsider how they relate to the subject matters entrenched within the ontologically complex representations on view. 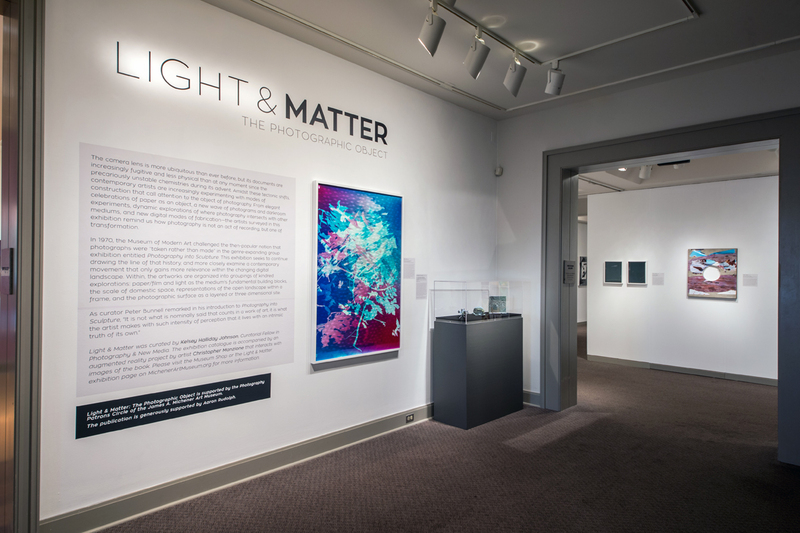 Light & Matter features works created with, through, or around the use of a range of photographic processes. 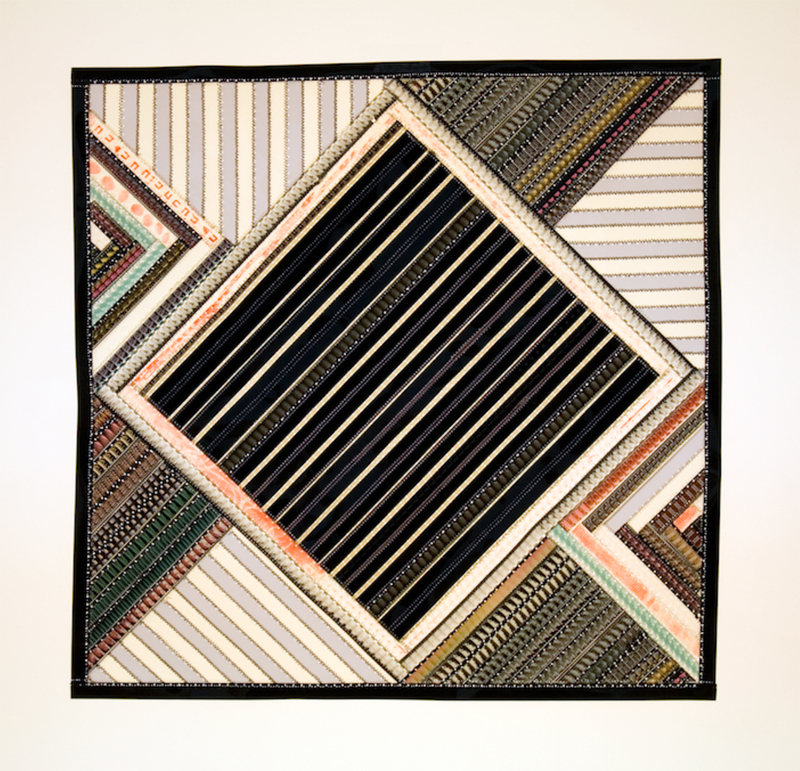 This breadth of approaches and processes is extensive, with Sabrina Gshwandtner’s sewn 16mm film quilts, Catherine Jansen’s photosensitized cloth installation, and Christopher Manzione’s colorized 3D printed objects giving a sense of this marvelous scope of material and technique all rooted in the photography. Equally exciting is the web of artists featured in the show, ranging from major historic players like Berenice Abbott, Charles Sheeler and Robert Rauschenberg, to contemporary mainstays like Eileen Neff, to resounding newer voices like Letha Wilson and Micah Danges. Nothing in the show is expected; each piece and name holds a unique place in the constellation of works that push along its central premise, that from the alchemy of the darkroom to the magic static of the pixelated screen, photography has found and is finding ways to redefine and reinvent itself through unexpected interplay with matter– in the hands of experimental, searching, and knowing artists. Beyond this medium-specific thematic link is a strong sensibility for landscape: how photographic objects speak of and even create new kinds of space and highlight the spaces in which we find ourselves as 21st century humans. 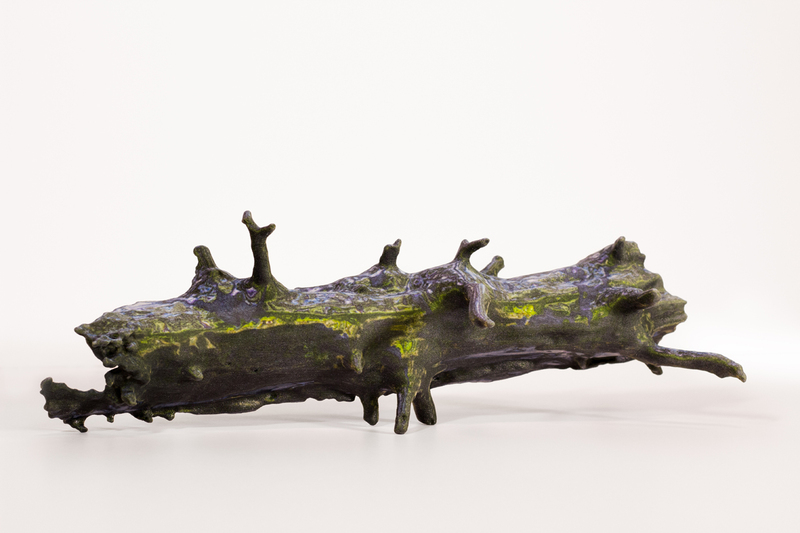 The pairing of Micah Danges and Eileen Neff’s work in the first gallery speaks to this. 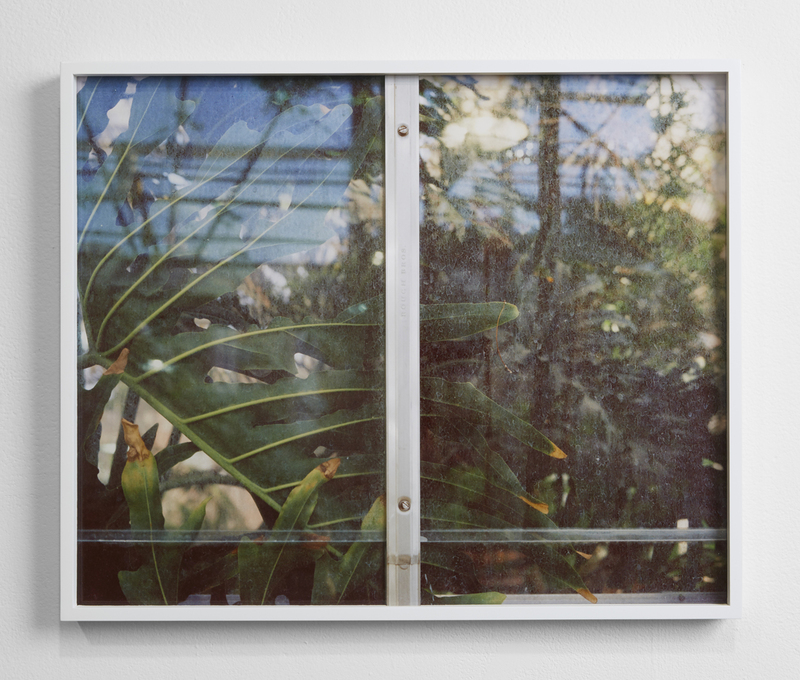 In Danges’ Window with Plant we stare, transfixed, at a splayed philodendron leaf, presented behind a dingy glass panel… or is it the photo that is dingy, or a photo of dinginess? Photo and frame, image and that which is represented, become one, creating a literal window, but also a phenomenological window into this familiar yet distant moment. 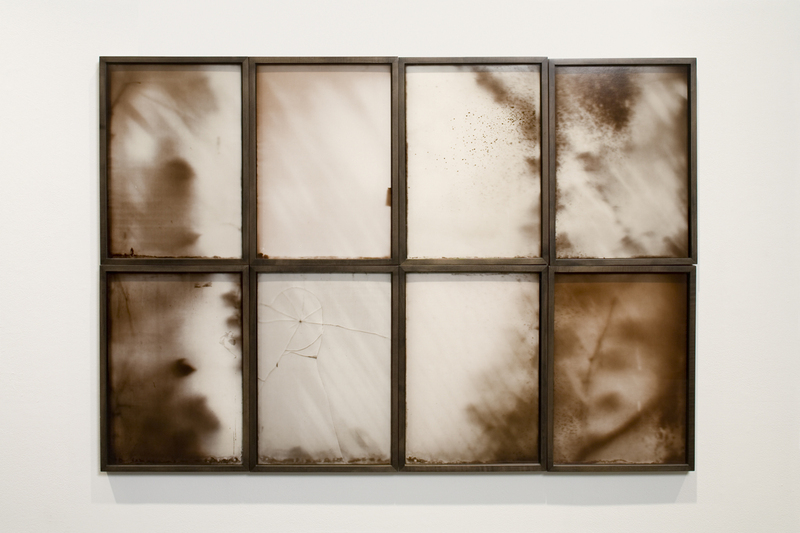 What we see feels like the thing itself — plant, window, grime — just at a material remove. 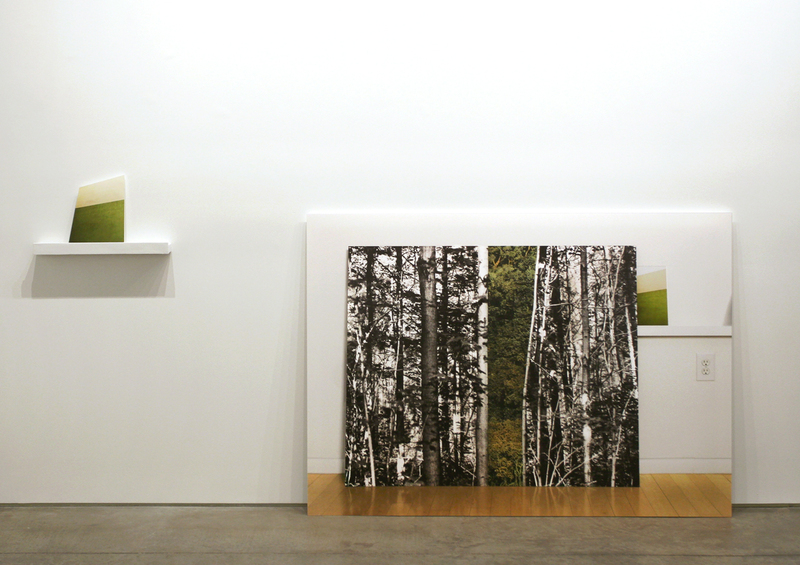 Neff’s neighboring Bookish and Forest in the Studio offer similarly spectral views of some version of nature. A kind of mis-en-abyme situation, where we cannot figure out a beginning nor ending to the visual situation, and into which we as viewers become enmeshed. It is not unlike stepping into the woods and losing a sense of one’s limits, yet here it is not a real landscape, but an allusive representation. Both Neff and Danges’ work create a sense of longing, to really be in a place that can only be accessed at arm, or eye’s, length. Several other works in the exhibition also offer intimate visions of places that are both felt and far away. Judith Taylor’s studio window, late afternoon, mitchell street (eight lights, #1-8) again situates the viewer on the outside, beyond an impenetrable space (an image of a window, in a window) that we are used to looking through; here the through is the subject of the work. 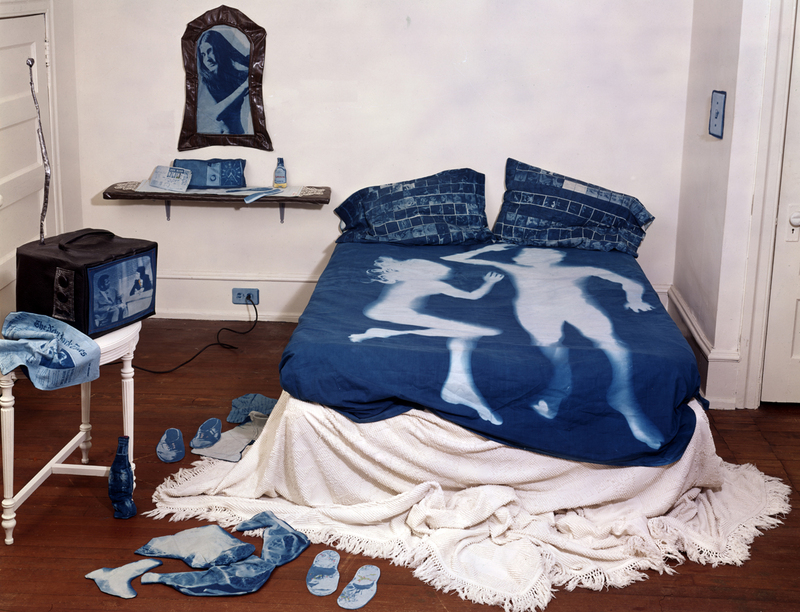 Catherine Jansen’s cyanotype textile installation, The Blue Room, is at once humorous, groundbreaking, and archival. A series of past events — the couple on the bed, frozen images on the TV, in a newspaper and in a mirror — haunt the scene like Keats’ Grecian Urn lovers who can never kiss. This stuck-in-time spatial array asks us to access history, to lie down with it and watch it, as it is laid out before us. 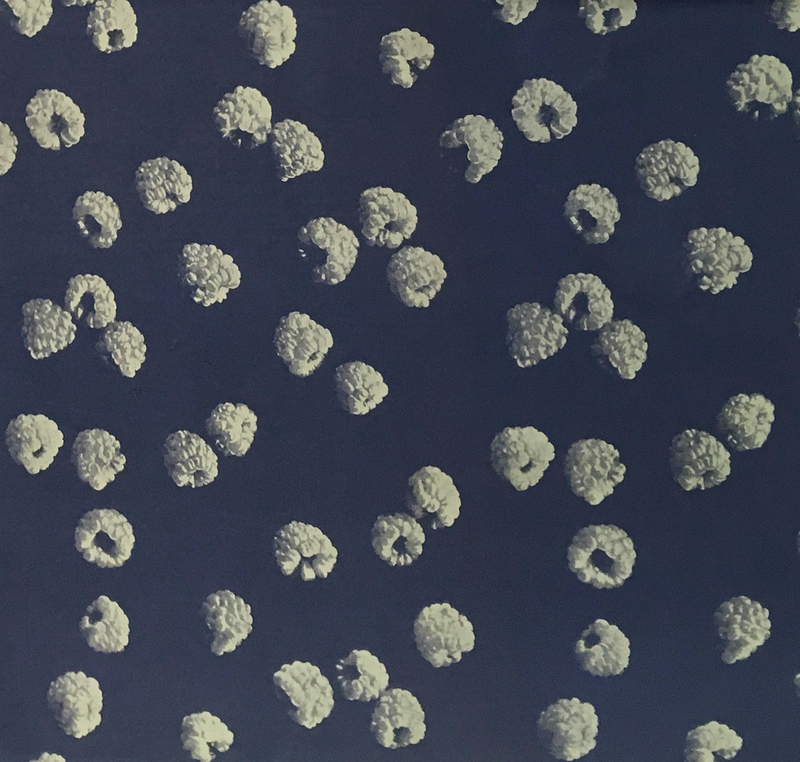 In Charles Sheeler’s Untitled (Blue raspberry print silk textile sample), raspberries are a quiet, familiar pattern that hover between a vanitas sensibility and a kind of commercial advertising. The delicacy of the silk and softness of the image are an amazing counter to Sheeler’s later photographs and paintings of hard-edged Pennsylvania industry. 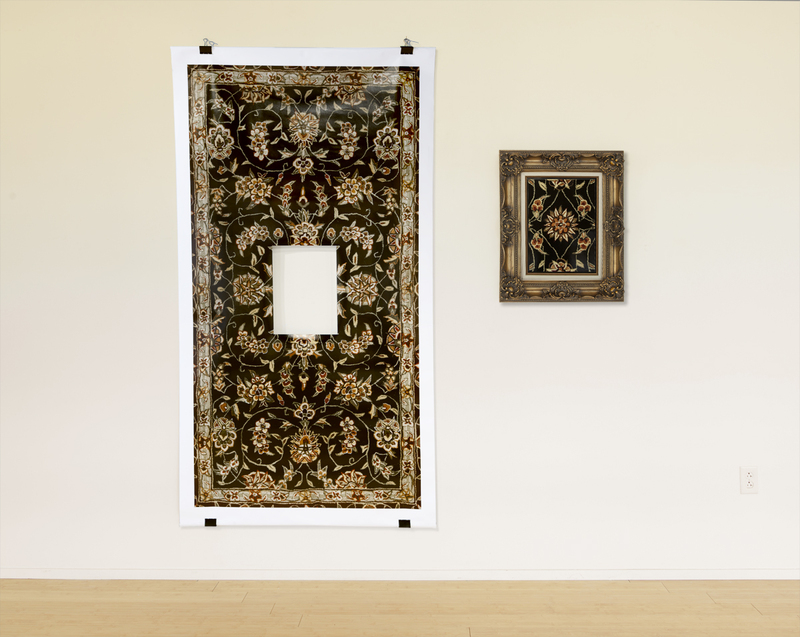 In Dan Taley’s Elevation, a removed and re-presented carpet-piece image, alongside the image of the full carpet from whence it came, fully engages the question of framing and perspective, part and whole. It offers a literal synecdoche that disrupts our sense of focus. Is the subject the framed fragment or the space of loss? Each of these works suggest spaces that are at once to be beheld and to beguile; as if only through intimate trickery might we get a better sense of our own place and position vis-a-vis the world around us. Many of the featured artists have connections with Pennsylvania, specifically Philadelphia, and so the exhibition not only showcases a sort of regional history, but may even offer clues toward a shared understanding of place. Curator Kelsey Halliday Johnson (the Michener’s Curatorial Fellow in Photography and New Media), seems to have tapped into something crucial here: by presenting this solid group of artists, all engaging questions of medium, we are able, as viewers, to contemplate questions of space — both environmental and temporal. 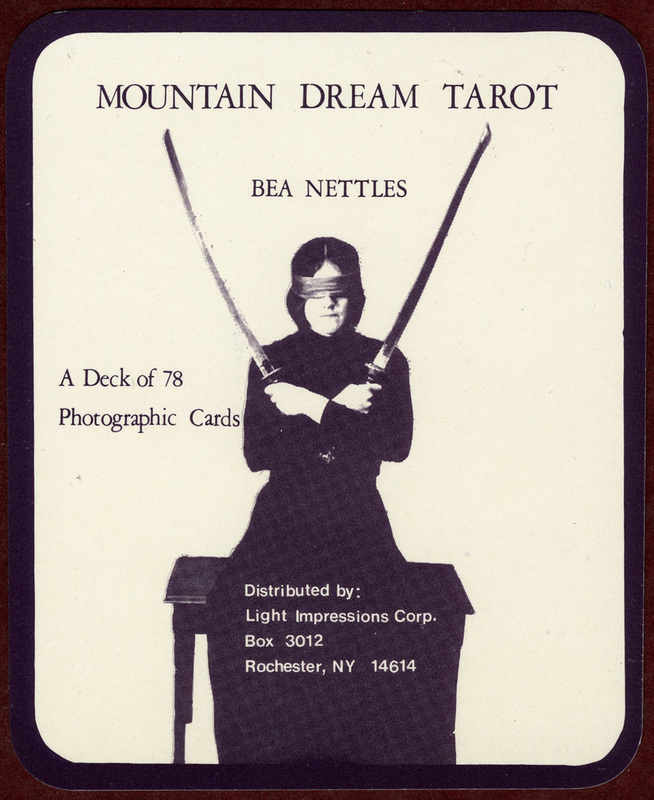 It is perhaps the stunning “Mountain Dream Tarot” deck by Bea Nettles that best embodies these questions, formally and conceptually. 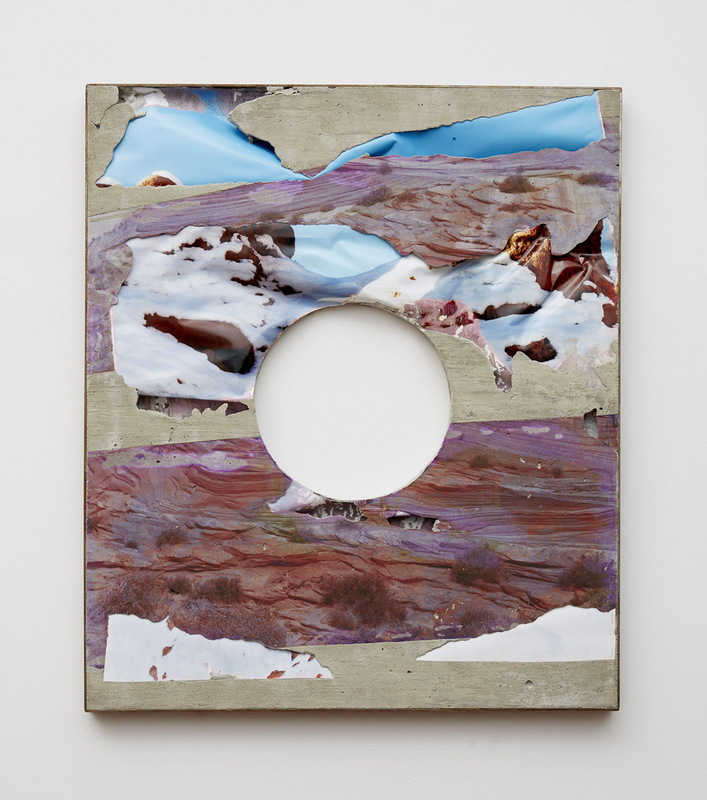 How do these new photographic objects speak of uncharted contemporary landscapes? How do they prognosticate, reflect on, and otherwise embody space and place, personal to the artists presenting them but also familiar in our shared experience of a(n increasingly) technologized world? Can fixed (and thus, past) images birth new visual and material futures? This show positions viewers as readers of an esoteric landscape of image and form, providing clues toward interpretations and meanderings through which to make meaning — both of the exhibition and spaces beyond.